We've been on the chicken adventure for a few weeks now. Many of my chicken illiterate friends (a group I have left!) have asked during the barnyard tour, "Do you have any eggs yet?" "No," is the answer because our birds are pullets (one must learn chicken lingo). Pullets are only 4 months old and won't start laying until they're 6 months old. So that is a disappointment. However, I might be getting a few eggs a week from a chicken trade. 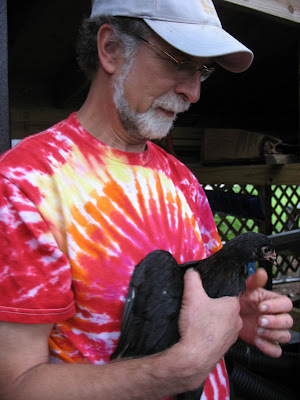 Chicken keepers are like soccer moms -- we share information and children and rides. It's good to know each other. "I would like the dark rooster back for breeding," said Lori, the chicken mama who sold me my 7 original birds, including three roosters, to be butchered when they're mature at 6 months. I can't remember what breed my chickens are, and don't really care, I agreed to the trade. Hens are imminently more valuable than roosters, who are loud and pretty much useless except to occasionally breed, for amusement (they like to dominate!) and to butcher and eat. Yes I intend to learn to butcher chickens. I already know how to eat them. Lori violated chicken etiquette. She dropped off the hen into the yard while we weren't home, a major faux pas. New birds, particularly older birds, should be sneaked into the hen house at night, when allegedly, none of the other birds will notice. Big Red, as we have named her, has been ostracized. 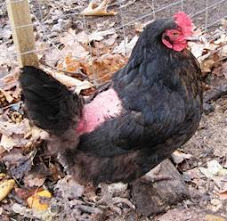 She spent the first night roosting in Bob's lumber house because she was afraid to go into the hen house. By the time I got out after dark to check on them and shut the door, I couldn't find her. Bob found her in the morning. The next night, she joined the flock inside, but still separate. I feel a little sorry for her. Having been a dash of salt in a bowl of pepper during high school, I feel compassionate for lonely creatures, who are excluded for whatever reason. Big Red has not laid a single egg in her debut week. I need to put some golf balls in the egg-laying nests to give her the hint. Hopefully she will settle in and produce. Chickens are very susceptible to stress. Maybe I'll play her some nice elevator music to relax. I just want a few fresh eggs for the several hundred dollar investment, to date! In this case, the chickens come before the egg. Gimme a few eggs! It's shocking how many chicken allusions are in the English language, even though we don't raise chickens any more. I'm curious -- give me a few in the comment section. The chickens have arrived - finally!